When Hope Valley's Maddie Thompson met a former wheelchair basketball Paralympian by chance, little did she realise it would lead to her developing a love of sport that has not just engaged her as a top class participant, but also opened up a potential career pathway too. As a youngster, Maddie Thompson wasn't really interested in disability sport. All that changed, however, when she attended Bakewell Show as an impressionable 10-year-old. She became interested by a man with a bright yellow prosthesis, whom she later discovered was British ex-Paralympian Callum Gordon, a silver medallist in wheelchair basketball at the 1996 Atlanta Games. One long conversation later, and Maddie was invited to give the sport a go at the Sheffield Steelers club. It was opportunity she could not resist. 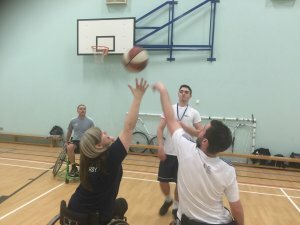 Having never participated in a disability sport before, she was apprehensive what her first experiences might be like, and assumed players would use "old NHS wheelchairs". Those preconceptions and assumptions were "crushed" as she walked through the door to see a fast and physical game with elite sports chairs and full-sized (10ft) baskets. "As a young disabled girl I never thought sport would be an option," recalls Maddie. "However, I loved swimming and my first taste of wheelchair basketball got me hooked – and I'm still there 11 years later." "I loved the speed of the wheelchairs and I've subsequently made so many lifelong friendships, which keep me coming back for more." Three years later, during the Under-19 National Championships, Maddie was awarded a signed GB Men's Paralympic Sydney 2000 vest for most valued player, which gave her added motivation to play at an elite level herself. Wheechair basketball is an inclusive sport that is increasing in popularity all the time. 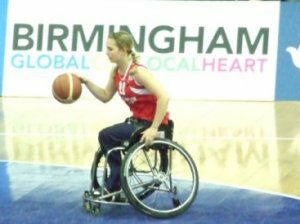 At just 13 years old, she became the youngest wheelchair basketball player to represent Great Britain when she flew out to Adana, Turkey to play in the 2008 European Under-22 Championships. The following year, the Derbyshire teenager was selected for the senior GB Team at the 2009 European Championships where the then 14-year-old went on to return home with the first of three bronze medals in that competition. Maddie says: "Being presented with Andy Blake's Paralympic Sydney top signed by the GB Men at that Under-19s Nationals was the moment when I realised this was something more than I enjoyed and could be something I was good at. "It was the start of the hunger to wear my own Paralympic top one day." After helping her country win a gold medal in the 2011 BT Paralympic World Cup – alongside a bronze at the Under-25 World Championships in Ontario, Canada in the same year – that dream became a reality at her home Paralympic Games of London 2012. "I would class that as the biggest achievement of my playing career," add Maddie. "It was amazing to play with my family's surname on the back of my playing vest." Since then, Maddie, now 21, has become increasingly interested in the delivery of sport and is consequently studying Sports, Coaching and Physical Education at the University of Worcester. As part of her course, she has also undertaken work experience at Derbyshire Sport, where she has gained an insight into the sport development projects that goes on across the county to assist people in becoming more physically active more often. "My goal is to inspire someone into sport, the same way Callum Gordon opened up that opportunity for me," she explains. "Sport is now a big identity of my life." "Since the London 2012 Paralympics, disabled sport has become more accessible and I would encourage people to go try something new, as you never know where that path might take you. "It changed my life and it might change yours too, whether it is the social friends you make or the love for the sport you develop." If you are interested in getting involved in disability sport as a player, coach, volunteer or official, check out the Disability Sport section of the Derbyshire Sport website. If you want to find out more about wheelchair basketball specifically go to the wheelchair basketball hubs page. Think you would like to volunteer in disability sport? Check out the IMPACT project.